Read the answers to the user submitted questions below. If you can't find your answer here or anywhere else on our site, please call us at (818) 292-8008. Your question will be answered and your contributions may help future site visitors. We appreciate your participation in making the Great Minds Robotics website more informative and easier-to-use. I heard robotics is for boys. Will my daughter be the only girl in class? Your daughter will likely have other female classmates. The classes are mostly boys but we encourage anyone with an interest in computers, robots, and cool technology to enroll. Although our campus would make for an awesome party place, we're not set up to host parties. Do you offer winter or summer camps? Yes. We offer summer camps, winter camps, and spring camps. However, our camps are limited to an eligible group of Great Minds Robotics students only. If you are interested in joining one of our camps, we require enrollment in our year-round Robotics, Enhanced Robotics or Programming classes. More info about our camps. While we do not have classes exclusively designed for adults, it is possible for a parent to take classes as a student. What is the minimum term that I must sign up for? We ask that you pay for one month of classes at a time. Take a VIP Tour for FREE. Decide at your convenience if Great Minds Robotics is right for your child. Trial classes are available; call us to schedule. The cost for trial class is $50 per child, which can be applied toward your first full month's tuition. Review tuition. Do we need to buy the robots? All you need to provide is a child ready to have a blast while exploring a world of technically advanced awesomeness. Everything else is included in the tuition. There are no equipment fees. Do we get to keep the robots? We are sad to say that your children can not take the robots out of the learning center (they tend to get a little homesick). Yes. $20 per month off each additional tuition. Do you offer discounts for enrolling in multiple programs simultaneously or attending classes multiple times per week? Yes. $20 per month off each additional 4 classes. Is there a cost for a make-up class? As a courtesy, make-up classes are offered at no cost with proper notice; see our Make-up Policy for more details. What kind of competitions do your students participate in? We currently participate in VEX IQ Challenge and World Robot Olympiad (WRO). Does my kid have to be enrolled to be on a team? Yes. Only students of Great Minds Robotics can join our teams. Is my kid guaranteed to be on a team? Team size is limited depending on the rules of each competition, as well as our own restrictions. We do not guarantee placement on a team. Does my kid have to be on a team? Competition participation is optional. We definitely encourage students to give it a shot. Is there a cost to be on a team? All expenses directly related to a competition, such as team registration*, robots, practice mats and tables, robot game elements are sponsored by Great Minds Robotics. We ask that you pay for a team t-shirt and/or sweatshirt for your child. There may be a charge for competition training labs and some team meetings - details are provided to prospective team members. Most events are not held at our location. We do not provide transportation, lodging, and food. We do not cover the associated costs. *Team registration refers to initial fees payable to the competition organizers to form the team. We may, at our option, cover event entrance fees payable to event partners. We do not cover these fees if they include lodging and/or food. We do not cover any fees for guests or parents, even if parents are required to attend the events. Is there a time commitment to be on a team? Yes. We train 4 - 6 times per week; training intensity increases as we get further into the season. Attending the training sessions is mandatory; students who are excessively absent will be dropped from the team. How does my kid join a team? Students can join our teams by invitation only. While we don't disclose our selection process, it is very much merit-based; therefore, we strongly recommend taking extra classes, as well as summer camps, in order to increase your child's chances of receiving an invitation. Can my kid change his mind and/or be removed from the team once selected? Yes. While we encourage everyone to participate in competitions, we understand competitions are not for everyone. Please keep in mind, however, that quitting the team during competition season affects the entire team. We may remove team members for various reasons, such as improper behavior, missing practice sessions, and failure to participate as an active member of the team. If we miss a practice session, is there a make-up session we can take? No. Missed practice sessions cannot be made up. My kid was on a team last year. Is she guaranteed a spot? We strongly believe in meritocracy over seniority, and therefore do not guarantee spots to prior team members. However, skills and experiences learned through participation in prior events may position your kid to be one of the top candidates for future competitions. We have a Make-up Policy. What if we take some time off for travel? We can keep your child's spot in class for up to 60 calendar days when you pay in full for your next month of classes. For instance, if you're traveling for two months in the summer - say, June and July - we ask that you make a non-refundable payment for August prior to your trip in order for us to keep your child's spot. Limit 60 days per year. See our Make-up Policy for more details. How can robotics and programming be applied in real life? If your child's future profession includes programming, robotics, and engineering, enrollment in Great Minds Robotics can provide a solid foundation in object-oriented programming, mechanical engineering, teamwork, and well-developed critical thinking skills. My kid wants to be a doctor. How will they benefit from your program? We teach your children to think like the best doctors in the world even though we're not a medical school. We teach them to think critically. Our instruction fosters a clear head, the ability to save time, the confidence to make decisions, and the skills needed to see beyond personal bias. This mixture of ability and confidence can benefit your child throughout life. As a bonus, the robotics training they receive here will translate directly to using incredible technologic marvels like the Da Vinci robot by Intuitive Surgical. How will a future enterpreneur or a corporate business manager benefit from your program? In a world as complex as ours, it's not really possible for anyone know all the answers. We teach your children how to quickly find the best answer when it counts. We teach them to think critically. Critical thinkers often outperform their peers when put to the test. When your child goes to work for themselves or someone else, they will be able to open doors to opportunity in the real world. Does my child need prior experience? All they need are interest and the desire to excel when it comes to robots, computers, and technology. What if my child has prior experience? Our instruction is tailored to each child's individual knowledge level and abilities. Your child's prior experience might help them to progress at a faster pace. We will leverage demonstrable knowledge of robotics and programming your child attained, fill in any gaps in concepts, and progress them further at their own pace. My child enjoys building LEGO, but has no experience with LEGO Technic or LEGO Mindstorms. How can they improve their building skills? We recommend attending our monthly Lego Technic workshops designed to improve building skills. We have various models to choose from, advancing our students from beginner to advanced LEGO builders. One workshop per month is offered at no extra charge for enrolled students; additional workshops can be purchased for $15. My child is not into building LEGO, but is very interested in programming robots. Do you have a program that's right for them? Yes. We can provide pre-configured robots for your child to reduce or entirely eliminate the need to build, and concentrate on the programming aspects of robotics. We can also use virtual emulators to test out our programs without the need for a physical robot. My child is not into robotics at all, but is very interested in learning how to program games, apps and websites. Do you have a program that's right for them? Yes. We offer Programming classes, with focus on general purpose computer programming (commonly known as "coding"). Students learn concepts of game development, program mobile apps, web applications, data-driven applications, and more. We teach professional Object-Oriented Programming (OOP) languages such as C#, Java, and C++. At what age can my child join your program? Grades K-3 (ages 5-8). In some cases, younger students may not be ready for our program; this is determined on a case-by-case basis, and is outside of the scope of this FAQ. 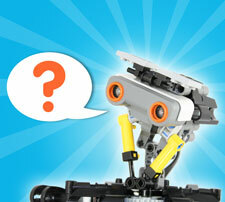 Explain the difference between Robotics and Enhanced Robotics. For beginners, the main difference is the target age group. Both programs are custom-tailored to each student based on demonstrable knowledge; however, Enhanced Robotics program relies on certain knowledge of mathematics not typically taught prior to 4th grade. Grades 4-8 (ages 9-13). Some students may not be ready for our program; this is determined on a case-by-case basis, and is outside of the scope of this FAQ. Explain the difference between Enhanced Robotics and Programming classes. Enhanced Robotics focuses on mechanical design and programming of robots (real and/or virtual). We start with graphical languages, such as NXT-G/EV3-G, and progress to typed languages, such as RobotC. Students learn concepts necessary for Robotics competitions; many of these concepts are also applicable to general-purpose programming. Programming classes teach "coding", or general-purpose computer programming. Assignments include making video games, programming mobile apps, web applications, data-driven applications, and more. Students use professional Object-Oriented Programming (OOP) languages such as C#, Java, and C++. Quite a few students enroll in both Enhanced Robotics and Programming classes, especially as they gear up for competitions, and/or advance in their learning of robotics and programming. Do I need to be enrolled in class to take a lab? Yes. Enhanced Robotics Lab is a supplemental hands-on experience that we offer in addition to the material learned in Enhanced Robotics class. They are available at an additional cost, which is announced at the time each lab is offered. Grades 4-12 (ages 9-17). Some students may not be ready for our program; this is determined on a case-by-case basis, and is outside of the scope of this FAQ. My kid has no prior experience. Can they enroll in Programming classes? Maybe. We strongly recommend starting in our Enhanced Robotics program first, unless your child has no interest in robotics, and has good typing skills. We will need to evaluate your child for our Programming classes prior to enrollment. What programming languages and technologies do you use? We use professional development environments, such as Visual Studio, Eclipse, IntelliJ, Android Studio, SQL Server Management Studio, and more. What if a student comes up with a really cool project/idea? We salute the creativity and let students implement their ideas into reality with our help and instruction. Many of our students create unique games and apps. We even have a graphics designer on staff to create custom graphics specifically for your child's game or app - at no additional cost. Acceptance into Advanced Programming classes is merit-based, regardless of age. My kid has no prior experience. Can they enroll in Advanced Programming classes? No. We strongly recommend starting in our Enhanced Robotics or Programming classes first. Explain the difference between Programming and Advanced Programming classes. Advanced Programming focuses on serious software development concepts, including algorithms, best practices / patterns, Test-Driven Development, creation of software libraries, object oriented class hierarchy design, abstract classes/interfaces, networking/web services, database design and development, and more. Projects are typically much larger and may be assigned to a group of students who work as a team. Students learn to use code repositories (Git), memory/code profilers, ticketing systems for bug tracking, advanced debugging features (logging, remote debugging, conditional breakpoints, etc. ), and other advanced concepts.